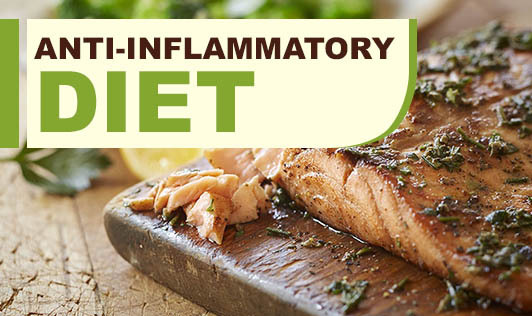 A diet high in fat, high in red meat and high in processed foods is likely to increase inflammation, while a healthy diet made up of whole foods can actually help to decrease inflammation and pain. 1. Adding anti-inflammatory foods that contain the right type of fats in your diet will impact pain and inflammation in a positive way. 2. Omega-3 essential fatty acids found in cold water fishes, walnuts, flax and pumpkin seeds will help to reduce inflammation. 3. Protein is needed to build healthy body tissues. 4. Good protein choices include lean poultry, fish and seafood, soy and its products, nuts, legumes and seeds. 1. Stay away from the starchier carbohydrates like pastas and white breads and you should avoid sugar too as they will increase inflammation in your body. 2. So choose green leafy vegetables and brightly colored vegetables and lots of fresh whole fruits. • Breakfast could be oatmeal served with fresh berries and walnuts, with a cup of soymilk. • Snack on whole fruits, nuts, seeds, and fresh vegetables throughout the day instead of cookies and candy. • Eat more fish and less fatty red meat. • Stay away from deep fried foods and bake or stir-fry your meals instead. • Choose green, orange, and yellow vegetables for your side dishes. • Drink plenty of water, fresh juices, herbal teas.